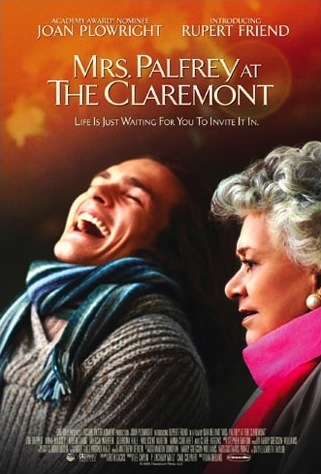 The latest little gem of a film Netflix has introduced me to is Mrs. Palfrey at the Claremont. The film, based on a story by Elizabeth Taylor, requires a little bit of patience at the beginning, but it has universal themes of sudden, newfound friendship, and the sadness and loneliness one can feel when it comes to family. The message of the movie is to cherish what you have, and this is spoken to both the elder generation and the young. When you find true love or a true friend, hold on to them. Don’t be afraid to jump both feet in because “For All We Know” (a song sung in the film) “we may never meet again” ––at least in this world. Through a chance accident, Mrs. Palfrey meets a young writer (Rupert Friend) who makes a living as a busker, or someone who plays guitar for money on the street. At first Ludovic (Ludo) seems to be the very opposite of this little old lady. He wears raggedly clothes, neither rents nor owns his own apartment, and has no great love in his life. But he is kind to Mrs. Palfrey and through mutual loneliness they find kindred spirits in each other. They become adopted grandmother and grandson. Through Ludo, Mrs. Palfrey is able to remember and say good-bye to her late husband; through Sarah, Ludo finds love and joy. They understand each other as friends while their families are disappointed or don’t have time for them. The best part of the film, in my opinion, is the idea of a great connection of a first and third generation. I have known so many of my own friends and classmates who have been raised or been closer to their grandparents than their parents. That the very young can connect so well with the very old at times illuminates how similar the beginning and end of life is. At the beginning and end the important things are very clear: Enjoy love, enjoy family, enjoy life and God’s blessings. Just be for the sake of being! It’s the middle of life that’s the hardest. We have the burden of “being productive,” “contributing,” “doing something with our lives,” and so on an so forth. And how interesting is it that Ludo who really isn’t doing a whole lot in is life accepts Mrs. Palfrey’s statement of this fact over similar criticisms launched at him by his mother and a previous girlfriend. Old age understands youth and has a tactfulness that younger people lack. Through talking so fondly of her late husband Arthur, Mrs. Palfrey begins a change in Ludo, a yearning for something more, a desire for a great love of his own. The adopted grandmother also takes the time to soothe Ludo’s mother’s worries, telling her that though he isn’t a worldly success, he is kind, good, qualities far more important than material success. Another theme of the film is this idea of a “brief encounter” (indeed the 1945 film of the same name is brought up several times) and how people often connect with strangers suddenly and relate to these encounters far better than they do with people they have known for years. It is fun, thinking back on my own life, how many friendships have been started by just such chance encounters. I love when sitting with an old friend how we can’t quite remember how we met and how we can’t quite think of a time when we didn’t know each other. Last, but not least, Mrs. Palfrey at the Claremont has an unmistakable sensuality to it. The beginning shows Ludo at his typewriter as he writes and smokes and there is a close shot of his mouth as he reads the first sentence in Sarah Palfrey’s tale. Ludo and Mrs. Palfrey hug and lean on each other often, a familiarity that easily allows Ludo to pretend to be her grandson, and leaving us with the sense that if they were the same age, well, the late Arthur might have been given a run for his money. The Claremont itself is still a finely furnished hotel, but dull and aged, much like it’s occupants all who were probably very striking in looks when younger, but have now faded with age. Ludo is shabby out of poverty (a bit of his own doing), but despite that is a breath of fresh air in looks and energy, recalling the beauty and vitality of youth to the occupants of the Claremont. It is so true that the elderly are often invigorated being around youth and/or small children. They remember what they used to be and the great hope and promise of life when one is at the beginning. In addition, Ludo is a fantastic cook, his dish contrasting severely with the bland food served carelessly at the hotel. A quick series of cuts highlights what a gourmet cook he is. This is nearly passed over and is wholly superseded by the highlight of the film, his performance of “For All We Know,” but it should not be overlooked. As a cook alone, Ludo is highly underrated by both himself and society. Another theme this brings out is that sometimes we underestimate even ourselves, throwing our efforts into something we think we have talent in (in this case writing), and ignoring the even greater talent we have for things like cooking or music. How often have we known someone who is the best, most patient teacher in the world, but does not desire to be one for a living? How often have we known friends who rank their own sufficient, albeit mediocre artistic talents far above their very real unique talents with business or family? From the film, I think that Ludo is a sufficient writer, but I doubt that it’s his overarching talent. He is a dreamer and thinker more than a writer, and his friendship with Mrs. Palfrey shows that he has far more talent interacting with people rather than the written word. That’s not to say he doesn’t have talent as a writer; but it is heavily implied that he likes the idea of a being “a writer,” as so many young people do (myself included! ), but is possibly more suited to being a cook, a musician, a poet, or even a nurse. At the end, the film leaves us with the knowledge that good friends are hard to find, and sadly we often cannot find such friendship among the members of our own family. It stresses the importance of cherishing and being around the ones who do really love you and surrounding yourself with those people, especially at the end of one’s life. This is truly a gem of a film. It is rare in this day and age to find a story that dwells on real themes in such a sweet, poetic manner.